Make a run. 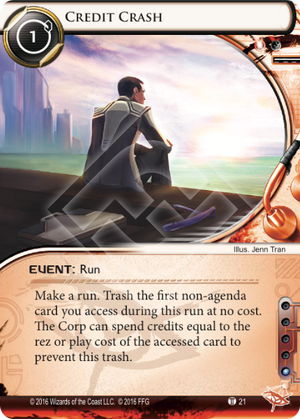 Trash the first non-agenda card you access during this run at no cost. The Corp can spend credits equal to the rez or play cost of the accessed card to prevent this trash. 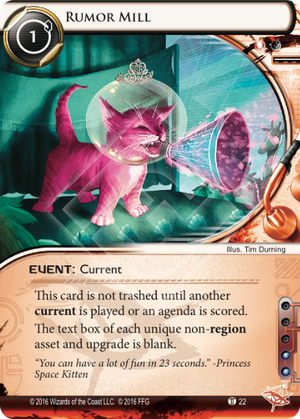 The text box of each unique non-region asset and upgrade is blank. When an encounter in which you used Nfr to break all subroutines on that piece of ice ends, place 1 power counter on Nfr. 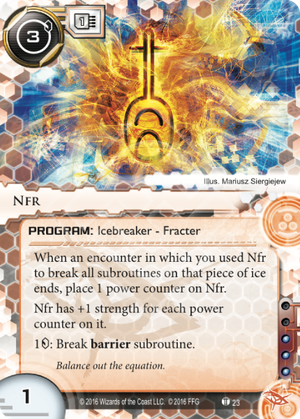 Nfr has +1 strength for each power counter on it. 2credit: Break up to 2 sentry subroutines. 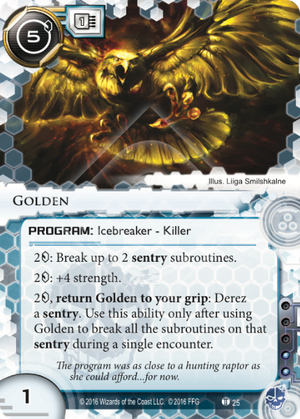 2credit, return Golden to your grip: Derez a sentry. Use this ability only after using Golden to break all the subroutines on that sentry during a single encounter. 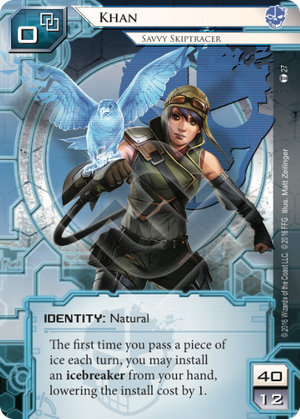 The program was as close to a hunting raptor as she could afford...for now. 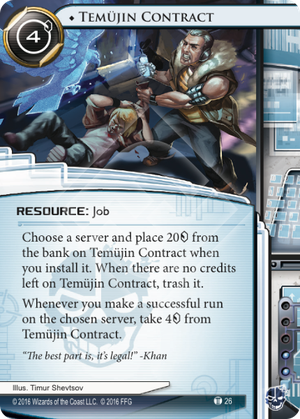 Choose a server and place 20credit from the bank on Temüjin Contract when you install it. When there are no credits left on Temüjin Contract, trash it. Whenever you make a successful run on the chosen server, take 4credit from Temüjin Contract. 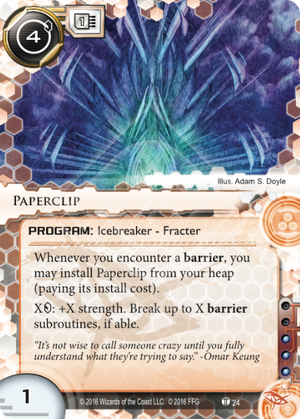 The first time you pass a piece of ice each turn, you may install an icebreaker from your hand, lowering the install cost by 1. 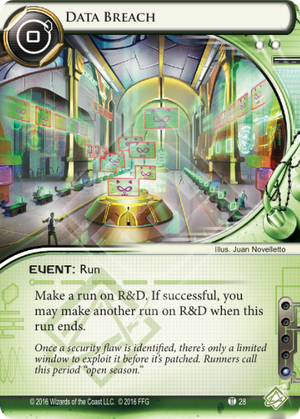 Make a run on R&D. 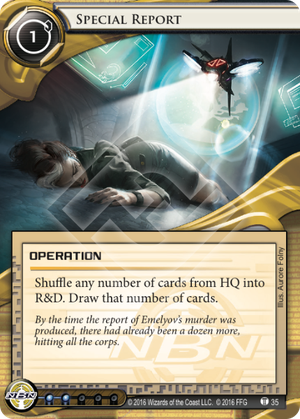 If successful, you may make another run on R&D when this run ends. Once a security flaw is identified, there's only a limited window to exploit it before it's patched. Runners call this period "open season." 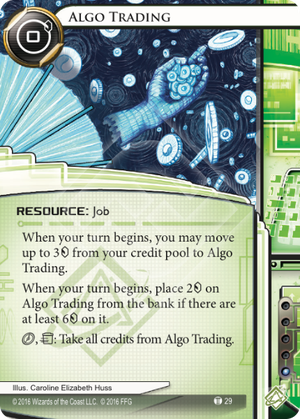 When your turn begins, you may move up to 3credit from your credit pool to Algo Trading. When your turn begins, place 2credit on Algo Trading from the bank if there are at least 6credit on it. click,trash: Take all credits from Algo Trading. If the Corp has 5-9credit when your turn begins, gain 1credit. 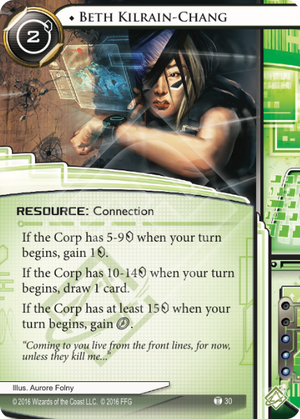 If the Corp has 10-14credit when your turn begins, draw 1 card. If the Corp has at least 15credit when your turn begins, gain click. 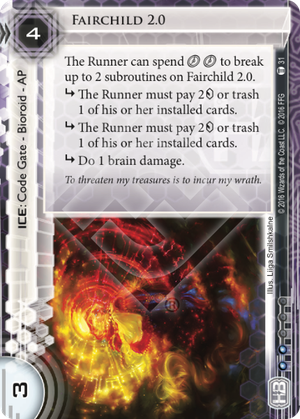 "Coming to you live from the front lines, for now, unless they kill me..."
The Runner can spend clickclick to break up to 2 subroutines on Fairchild 2.0.
subroutine The Runner must pay 2credit or trash 1 of his or her installed cards. subroutine Do 1 brain damage. To threaten my treasures is to incur my wrath. 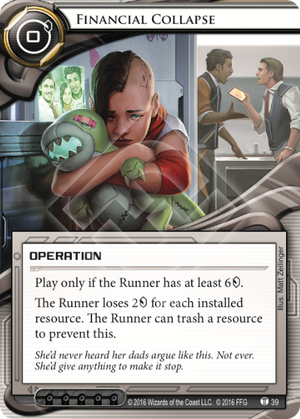 subroutine You and the Runner secretly spend 0credit, 1credit, or 2credit. 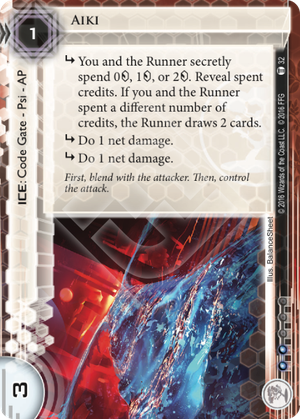 Reveal spent credits. 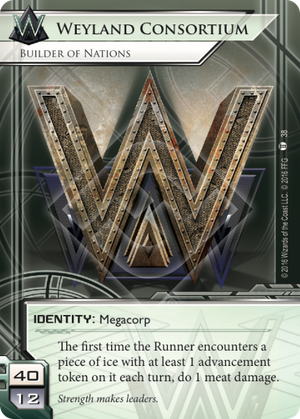 If you and the Runner spent a different number of credits, the Runner draws 2 cards. First, blend with the attacker. Then, control the attack. 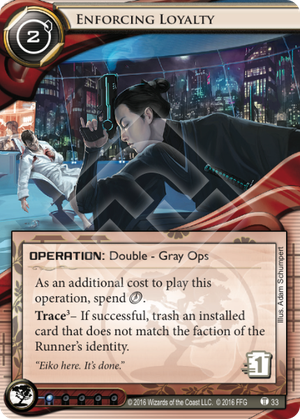 Trace – If successful, trash an installed card that does not match the faction of the Runner's identity. 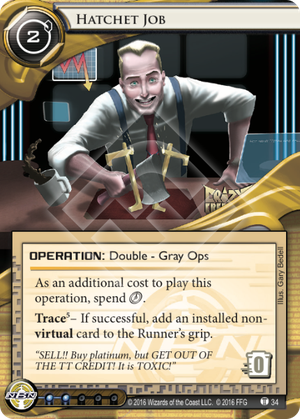 Trace – If successful, add an installed non-virtual card to the Runner's grip. "SELL!! Buy platinum, but GET OUT OF THE TT CREDIT! It is TOXIC!" By the time the report of Emelyov's murder was produced, there had already been a dozen more, hitting all the corps. When your turn begins, you may move up to 3credit from your credit pool to C.I. Fund. 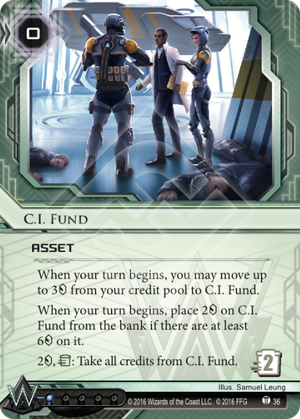 When your turn begins, place 2credit on C.I. Fund from the bank if there are at least 6credit on it. 2credit,trash: Take all credits from C.I. Fund. Trash any number of your rezzed cards and gain 3credit for each card trashed. 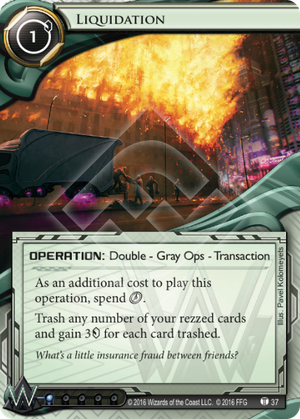 What's a little insurance fraud between friends? The first time an encounter with a piece of ice with at least 1 advancement token ends each turn, do 1 meat damage. 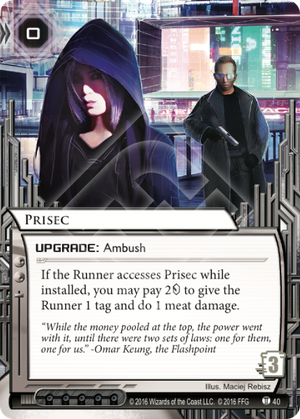 If the Runner accesses Prisec while installed, you may pay 2credit to give the Runner 1 tag and do 1 meat damage.